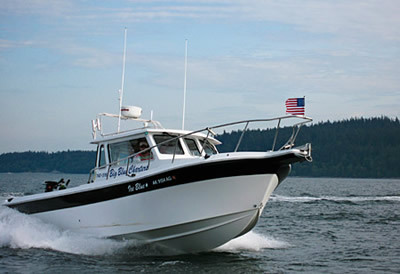 BAMF was founded by Alaskan fishermen who each brought a unique set of experiences and skills to the company including: ex-coast guard personnel, a fiberglass laminator, and the operator of a charter fishing operation for 14 years in Alaska. So we are a group that knows a thing or two not only about boats, but about what is needed and demanded of a boat by serious fisherman. There are a lot of good boats out there but we felt that we could provide a boat with a design and unique set of features that would meet the needs of fishermen in a way that most boats don’t. What sets us ahead is our overall design, which provides an extremely stable vessel with a fully-enclosed cabin, V-berth and a true walk around deck, plus the convenience of the components and the ease of repair and maintenance. We also now offer a full cruiser cabin style with the same hull design, giving you 4 models to choose from with the same comfortable ride. We also want to take into consideration our customers requests and desires to form a completely “customized” boat. The BAMF team invites you to take your boating to a new level!